Have You Seen This Scarf? 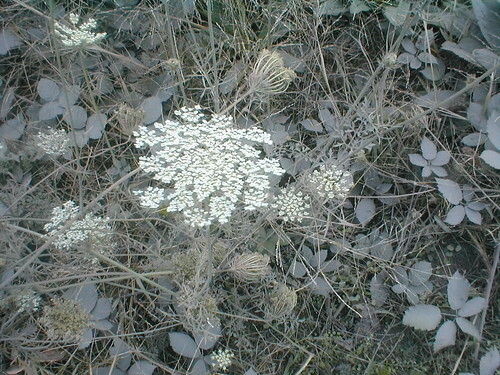 While in Portland, I went walking down a dusty roadside lined with Queen Anne's Lace, and was reminded that I've been wanting to crochet a scarf and matching headband with the traditional crochet lace pattern of the same name. I did a couple of swatches, and now I'm getting an odd sense of deja vu. Like I've seen this scarf before. I'm thinking of making this pattern available as a free download (good way for me to practice making a crochet symbolcraft chart), but I don't want to inadvertently step on any toes in the process. Have you seen a scarf in a book or magazine lately that looks like this? Dana found it! 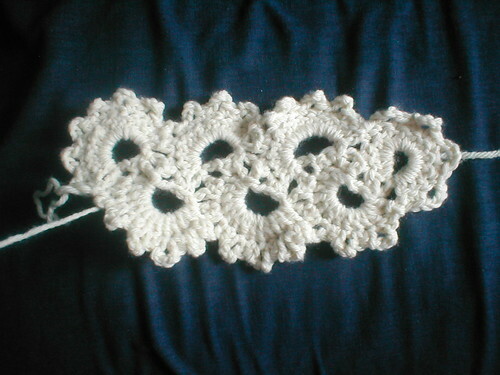 The Ruffle Cravat from Leigh Radford's book One Skein has a crocheted scarf made up of half-circle motifs. Similar, definitely not the same. I've also been reminded that as long as the specific pattern is my own, I wouldn't be in violation of copyright, but I still like to make sure that a needlecrafter is not going to come along and say hey, that's a rip-off of That Pattern from That Designer!